Splash pad and playground equipment. 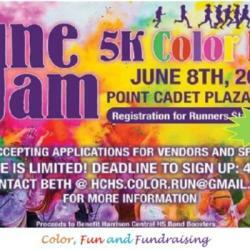 This color walk/run features a designated 5K course. During the race, participants are doused with color at various color stations ending with one final color celebration at the finish line. After the run is complete, vendors will be set up for even more fun! All proceeds go to benefit the Harrison Central High School Band.